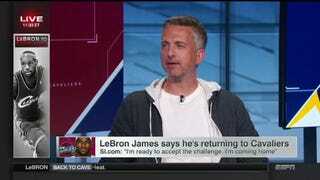 When ESPN president John Skipper announced that he would not be renewing Bill Simmons’s contract last week—four months ahead of his current contract’s expiration date—a lot of people were left wondering how Simmons would spend his last few months as a lame-duck employee. According to Sports Illustrated’s Richard Deitsch, we now know that Simmons is already as good as gone. SI has learned that ESPN and Simmons have worked out an agreement that officially ends his tenure as a front-facing employee for ESPN. Simmons sent an email to Grantland staffers this week informing them that he would no longer be working for the site he founded in 2011. Simmons will also no longer do podcasts or appear on television for ESPN. It’s not clear if Simmons negotiated some kind of buyout, or if ESPN is just going to pay him his regular salary for the next few months. Either way, he’s earned himself a pretty nice chunk of vacation time.